A low profile cowl vent featuring a small cowl providing 10,000mm2 ventilation area. The cowl incorporates barriers to prevent water ingress and block wind driven rain, allowing the water to drain away downslope. 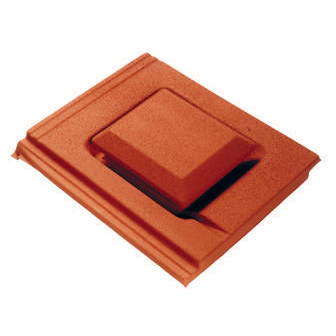 Ariel Plastics have a comprehensive range of tile cowl vents available to match most known plain and profiled tiles, with specials available on short lead times. A colour matching service ensures that even on a weathered roof the Corovent will blend discreetly with the existing tiles. Complete roofing to one course below the position for the tile vent. Hold vent in position as centrally as possible between the rafters and mark where the vent spigot touches the underlay. Cut underlay in a cross, fold up and back. Insert felt weir, if using, under batten above opening, positioning it centrally above the hole. Nail felt weir to the batten. Nail felt over the battens.